ArchTec Parkview 4 Waste Recyclers, with a 45 gallon capacity, offer a high performance upgrade for waste management initiatives. Engineered with stylish functionality, these all-steel units feature strong vertical slats accented with horizontal bands topped with a two stream flat top lid. A discrete lid to base cable attachment ensures the top stays with the base during and in-between servicing. 2 half-moon removable powder-coated liners are designed with built-in handles and bag clips which help prevent liner bag slippage, allowing hassle free routine maintenance. Finished in a weather resistant powder-coating, these ArchTec Parkview Waste Recyclers maintain the original performance and appeal throughout many years of service. ►Need an Archtec Recycler Fast? 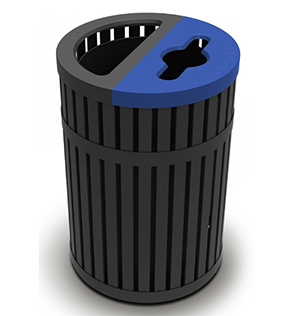 The dual stream black and blue split lid clearly distinguishes and encourages proper material disposal by offering 7.25" x 18" 'LANDFILL' and 5.5" x 13" 'RECYCLING' openings.